Integrate yoga inversions into your practice with this four-part course. There are many benefits that flow from the regular practice of inversions. They are energising and can assist with venous and lymphatic drainage, building core strength and fostering mindfulness. Inversions form a key part of Iyengar yoga and are practiced regularly as students start to move through the intermediate and advanced levels. Designed specifically for students still in the process of learning full inversions, this course will guide you step-by-step. Working through preparatory stages for the key poses will help you to build strength and confidence. 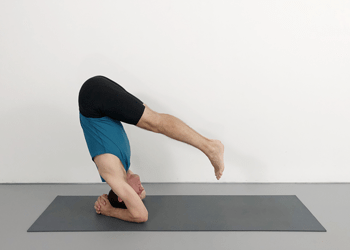 Ultimately, techniques that assist with the safe practice of full inversions are explored. Finally, linking them with standing poses, forward bends, backbends and restorative poses assists you in forming a balanced practice. This course will assist you to integrate inversions into your regular practice so that you can start to reap the benefits from these poses. They have therapeutic, strengthening and energising effects and form a key part of Iyengar yoga sequencing.